Pancake Recipe For A Flip Free Pancake Day! Are you flippin’ useless at flipping pancakes? Do you dread making a show of yourself on Pancake Day, as your half-cooked pancakes inevitably end up on your floor, ceiling, or hair? Fear not! Here at Glamping Under the Stars, we have a delicious, easy to make, no-flip pancake recipe for you. Make these, and your appreciative friends and family will never again complain that your pancakes are a load of crepe. Better still, they’re so easy, you can even whip up them up in a pan over the campfire, if you’re feeling extra adventurous and outdoorsy (though making them in the kitchen is ok too). Are you crepe at flipping pancakes? Try these! Also, a frying pan, a knob of butter, a tablespoon and a spatula. Carefully turn them over with the spatula – no showy-offy, flambouyant full pan flipping required! Cook for a minute more to finish the other side, then serve with pancake toppings of your choice. We like chocolate spread & strawberries or a little maple syrup & blueberries! And there you go! 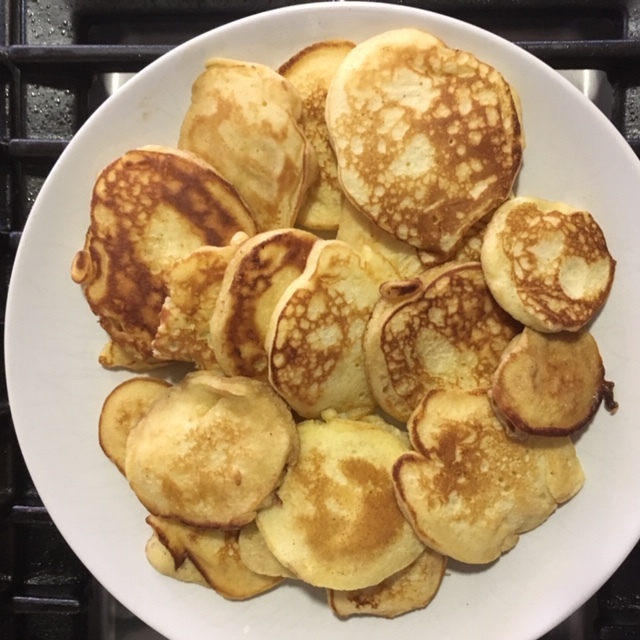 Delicious ‘mini-pancakes’ on the plate. Fuss-free, flip-free, and taste flippin’ great! Now you’ve mastered this recipe & side-stepped your flipping phobia, why not treat yourself & book a lovely, relaxing glamping trip with us?